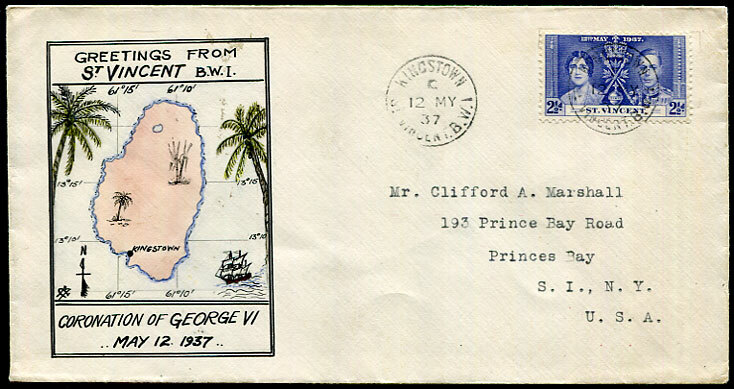 1937 hand-drawn and coloured cover for the Coronation of King George VI with KG6 2½d pmk'd Kingstown C/12 MY 37 addressed to Princes Bay, Staten Island, New York. Probably unique as such. 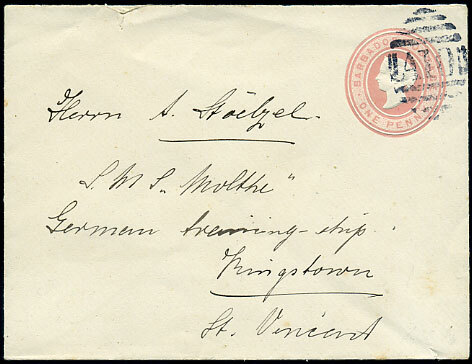 1888 use of QV 1½d deep brown Post Card with commercial text headed "13/10./88." 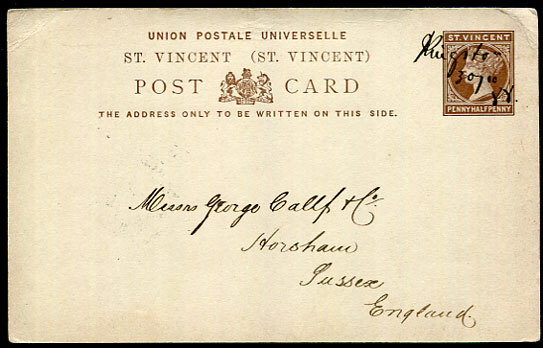 to George Callf & Co, Horsham, Sussex but not placed in the mails immediately as design cancelled by black ink manuscript "Kingstown 30/10 88." 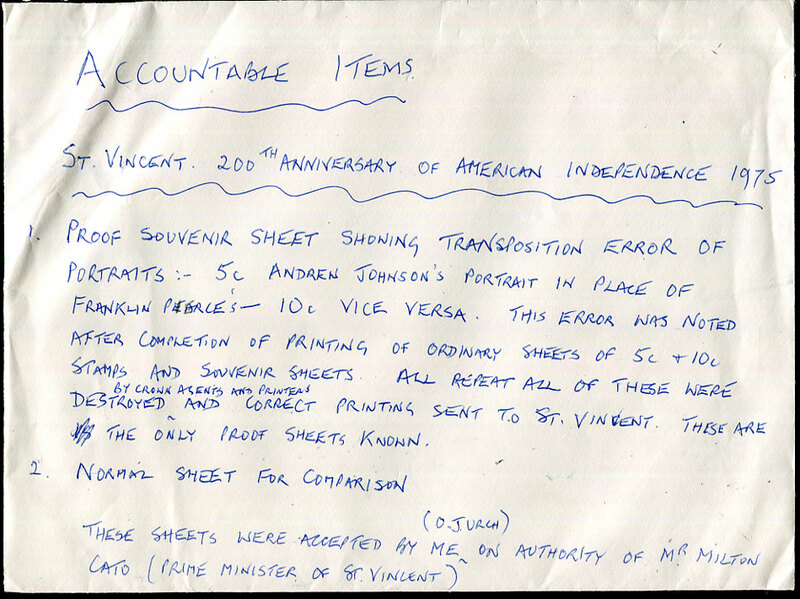 which may or may not be in the same ink as addressing, and may or may not have been added by the writer. 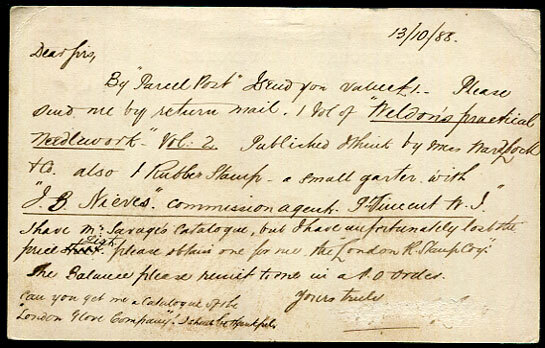 Evidently carried by enclosure as without normal postal markings. 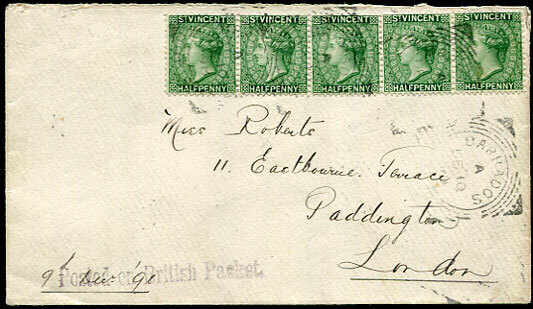 1898 cover to Paddington, London marked "9th Dec '98" at lower left with handstruck str. 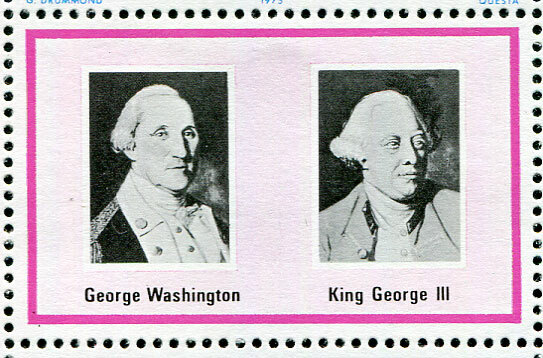 line purplish-black "Posted on British Packet. "posted with horiz. 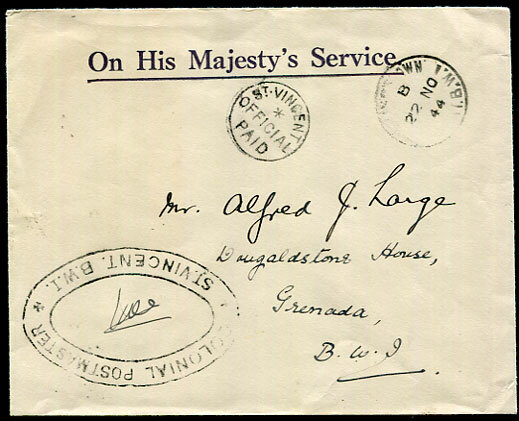 strip of five QV ½d green and carried "loose" until off-loaded with BARBADOS A/DE 10 98 sqc prior onward transmission, backstamped Paddington DE 21 98 arrival. 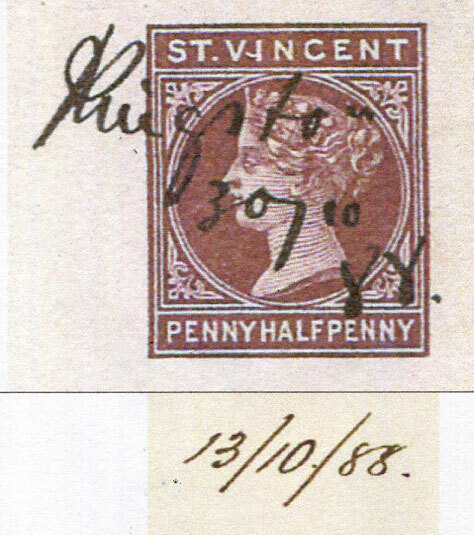 The Empire Penny Rate was introduced at St. Vincent on Christmas Day 1898. 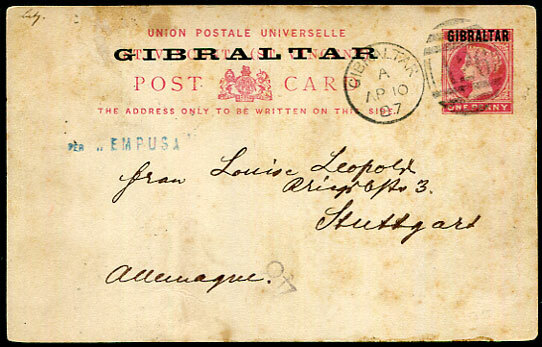 1887 use of the ST. VINCENT QV 1d carmine Post Card overprinted for use in GIBRALTAR written from MOGADOR with "Mog. 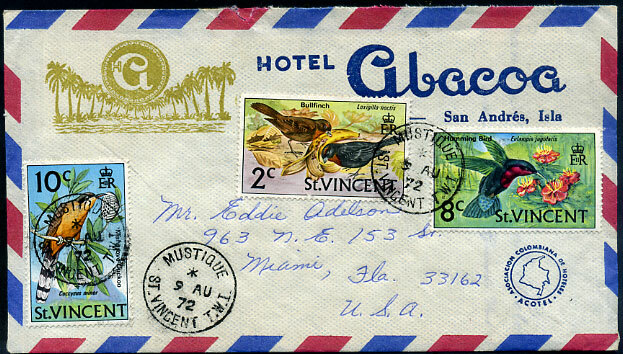 5/4 87" with turquoise PER "EMPUSA" to Stuttgart, Germany pmk'd at Gibraltar with "A26" duplex dated A/AP 10 87, some harsher toning. 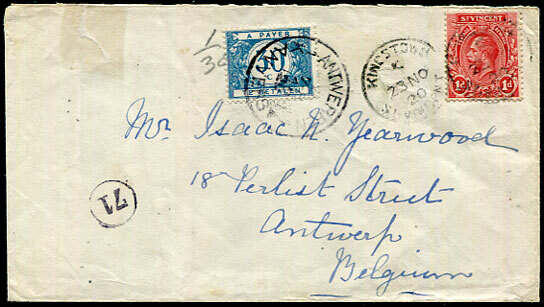 1920 underpaid cover with KGV 1d pmk'd Kingstown C/23 NO 20 to Belgium with 30c Postage Due tied Antwerpen cds, small repaired opening tear. 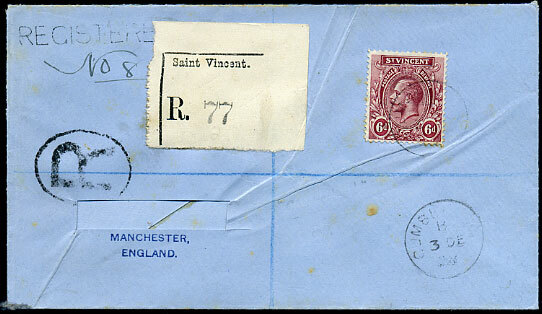 1899 use of QV 2d blue PSRE with added QV 1d red (SG.48b) pmk'd Kingstown A/AP 14 1899 to London paying the EMPIRE PENNY POST rate introduced DE 25 1898, no backstamps. 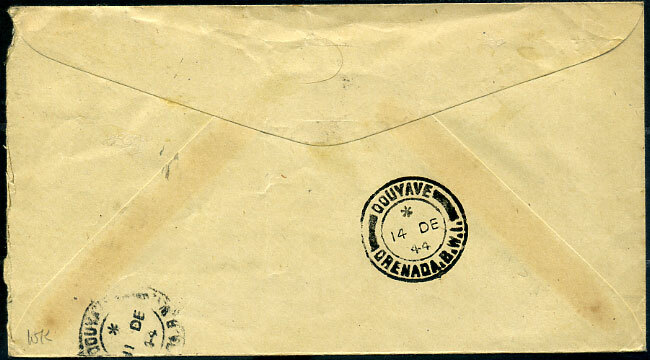 Short-lived use with this stamp as its replacement, the QV 1d Keyplate (SG.68), was supposely placed on sale 8 days later. 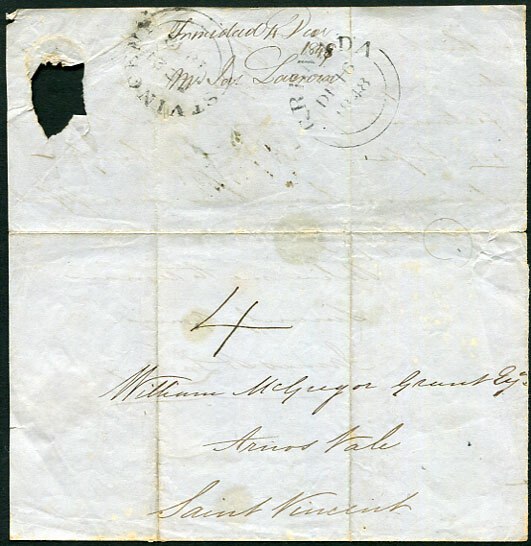 I have kept no record for earliest use SG.68 at Kingstown but at Barrouallie last use of SG.48b is AP 4 99 and earliest use SG. 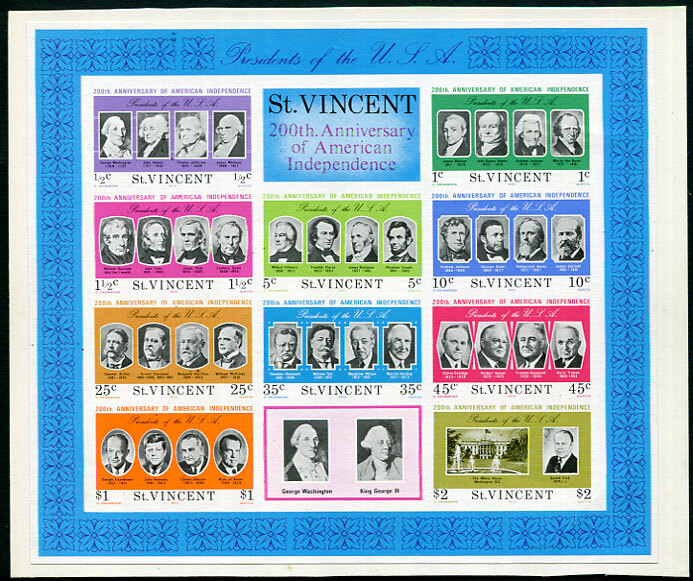 68 is AP 17 99. 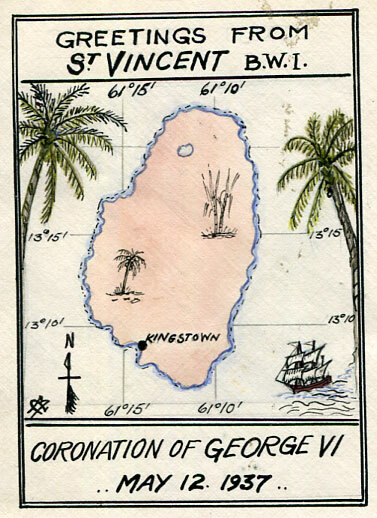 Probably the only survivor as such on full QV 2d PSRE. 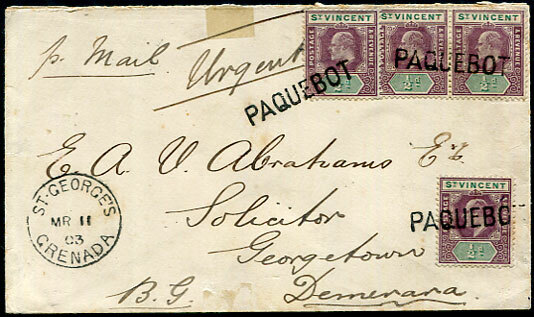 1898 cover to Syracuse, New York with CHATEAUBELAIR C/AU 5 98 (LRD) despatch and QV ½d pair, single, QV 1d red left to be pmk'd at Kingstown A/AU 5 98, some sealed opening tears top right. 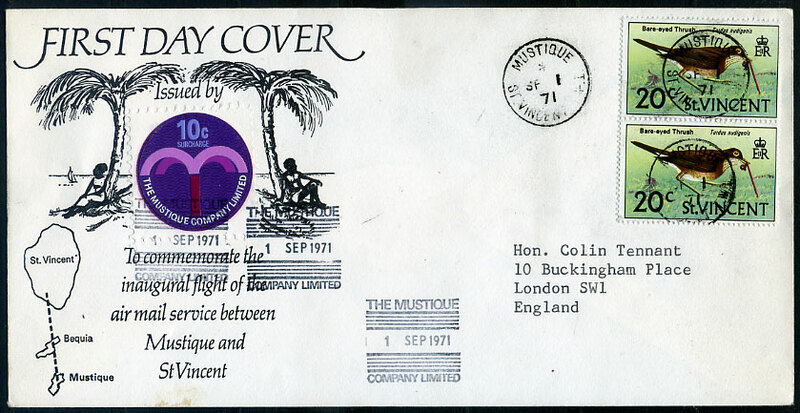 An important cover plugging the long-standing "unknown" period C/JU 22 98 (LRD per WIPHR) and SP 11 98 (date island being devastated by giant hurricane, PML Page 7). 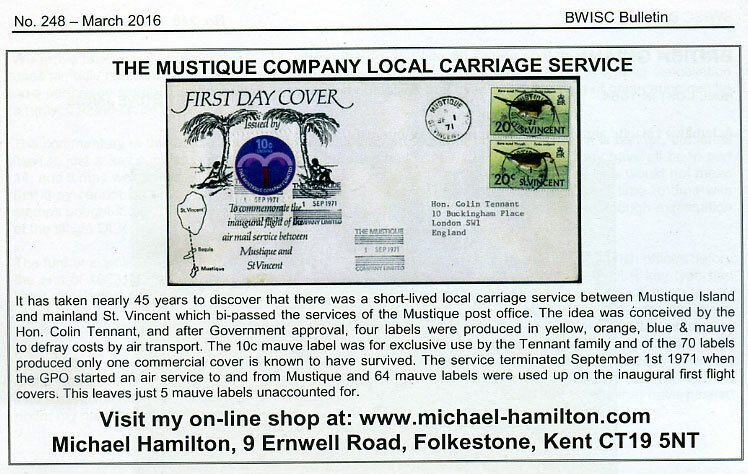 With the handstamp evidently lost the abbreviated "CH" had a late re-introduction with confirmed use OC 1 98 to MY 9 99. 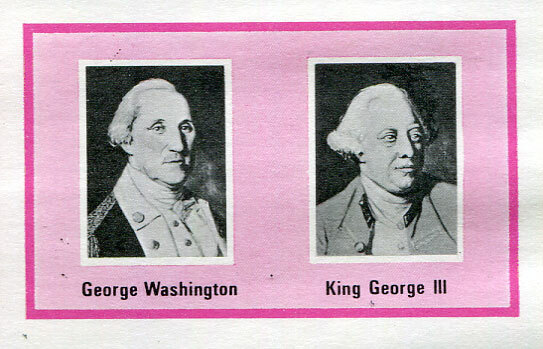 Nothing further is really known until the third type CHATEAUBELAIR is used earliest date AP 16 01. 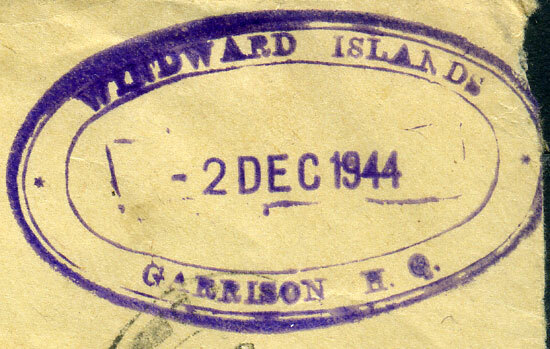 1944 stampless OHMS/S. 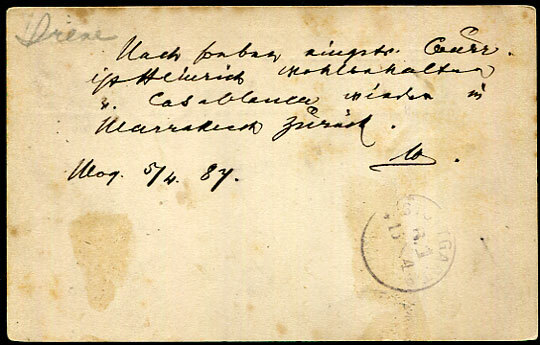 DE S.M. 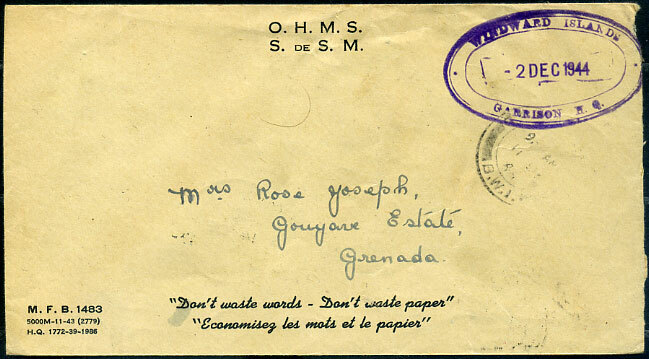 cover to Mrs Rose Joseph, Gouyave Estate with purple oval WINDWARD ISLANDS/2 DEC 1944/GARRISON H.Q. 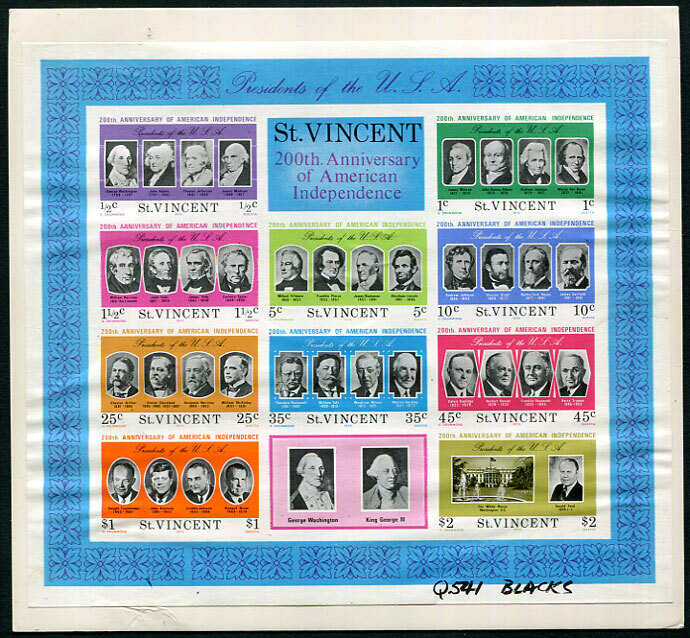 cachet, reverse GOUYAVE */11 DE 44 and */14 DE 44 d/rings. 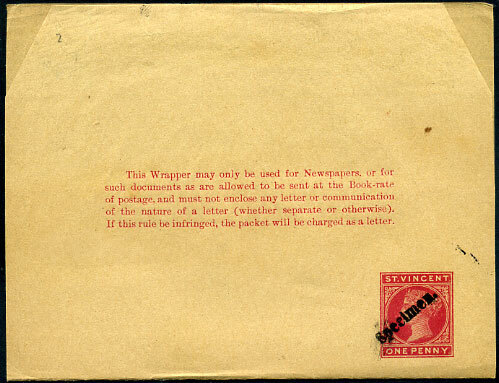 1893 QV 1d carmine newswrapper complete unused handstamped rare "Specimen." 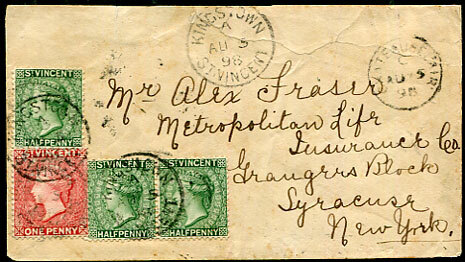 (Type XI, in upper and lower case type 19mm long with period, 2½mm high). 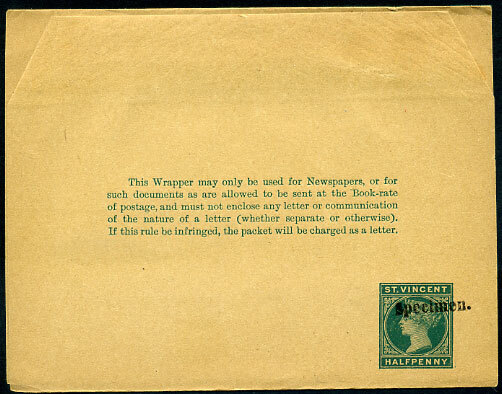 1893 QV ½d green newswrapper complete unused handstamped rare "Specimen." 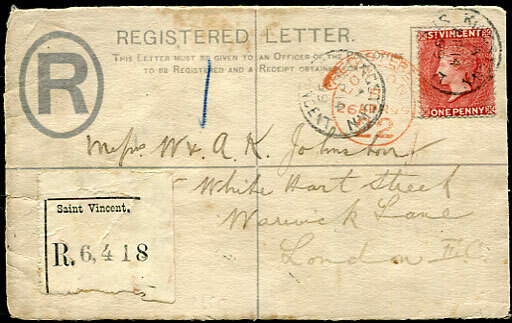 (Type XI, in upper and lower case type 19mm long with period, 2½mm high).